The coming and passing of National Barbecue Month (commonly called “May” by others) tends to leave a bad taste in my mouth. It’s the month when a lot of media outlets (magazines, newspapers, and television) remind us that barbecue season has officially begun. They mark the occasion by profiling notable pitmasters, sharing recipes and tips, and, as a bonus, providing a roundup of the best barbecue joints in your area or in the entire country. What’s regularly missing in these features are shout-outs to African Americans. Such omissions are troubling given the overwhelming contribution that African Americans have made, and continue to make, to the American barbecue tradition. Like good barbecue, my annoyance over this subject has been burning like a slow fire, and it hit a flashpoint last year. The Food Network aired Best in Smoke—a barbecue competition show that featured six contestants, six assistants, one host, three judges…and no black people. Think I’m hypersensitive? Then imagine watching a country music special that only featured interviews with Charley Pride and Darius Rucker. Wouldn’t you think there was something wrong with that picture? In contrast to mass media outlets like the Food Network, the SFA’s oral history and documentary film initiatives have paid homage to many African-American pitmasters. Check out CUT/CHOP/COOK, a film by Joe York about Rodney Scott of Hemingway, South Carolina. 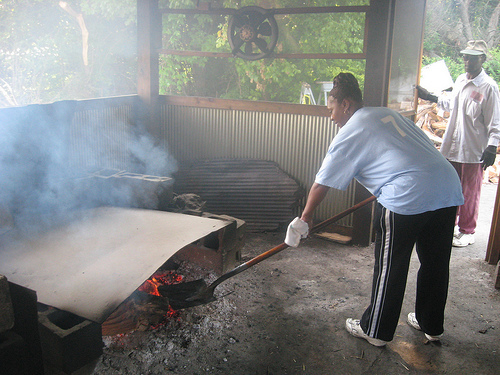 And explore the oral history interviews on the Southern BBQ Trail.Many of them feature African American subjects, from Helen Turnerof Tennessee (pictured above) to Gerri and Stephen Grady of North Carolina (and over a dozen more).